Julie Van Grol is seriously the teacher we wish we had in college! This badass babe is based in Minneapolis, Minnesota, and teaches at the Minneapolis College of Art & Design. 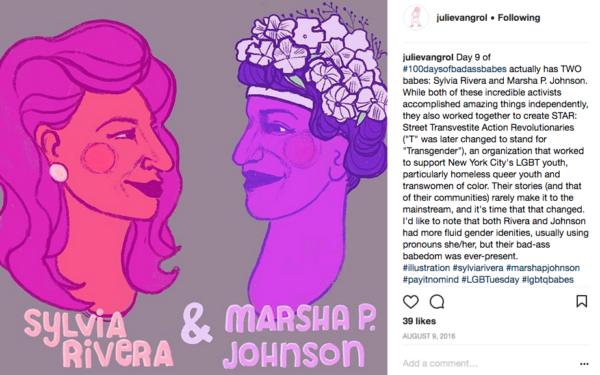 She is also an illustrator whose work has been featured on a number of major website including Takepart.com and The Huffington Post. 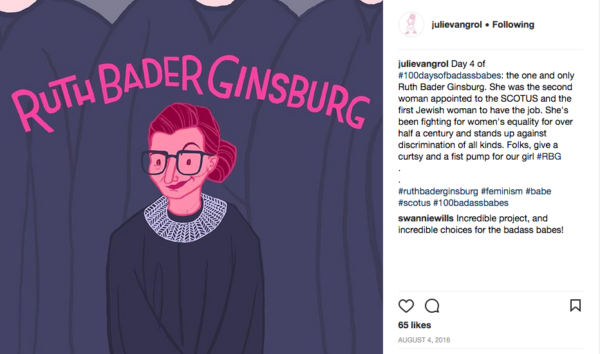 Julie launched a series called #100DaysofBadassBabes on August 1st on Instagram as a way to celebrate influential women throughout history and around the world who deserve more recognition. 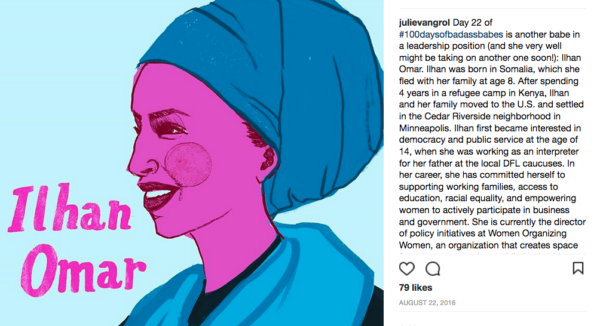 “Every day, for the next 100 days, I will illustrate a portrait of an inspiring, powerful, influential woman (this, of course, includes transwomen and I’m all about lifting up non-binary & gender-fluid folks, too). 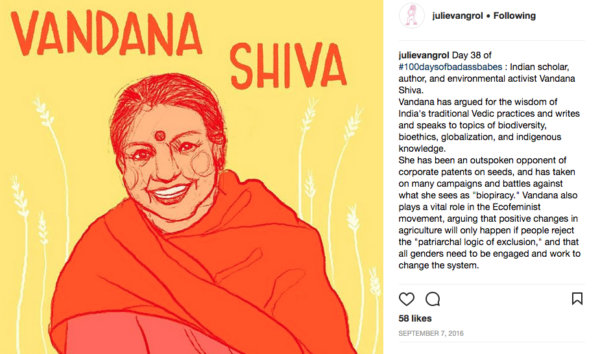 The hope is to not only celebrate all this badassery, but also learn a lot about the often unsung figures of culture and history,” she wrote on her blog. 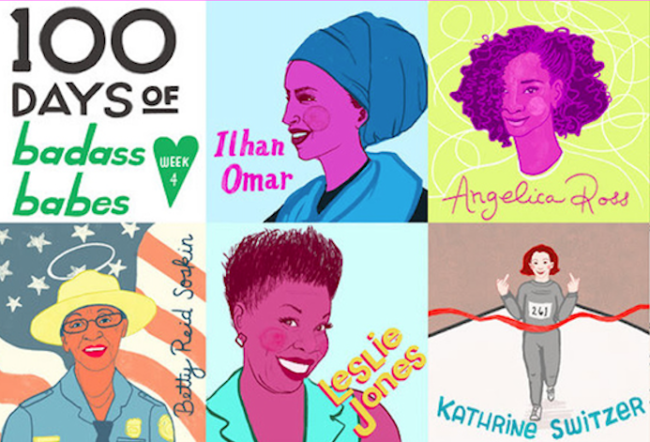 Some of the women she has included so far include Malala Yousafzai, Yusra Mardini (the Olympic swimmer and Syrian refugee whose story of bravery and courage earned her a spot in the first ever Olympic Refugee Team), technology pioneer Ava Lovelace, trans actress Laverne Cox, Supreme Court judge Ruth Bader Ginsburg, First Lady Michelle Obama, and marathon trailblazer Katherine Switzer. But there are also many women who are not as well known as others, whose stories Julie felt needed to be shared with a wider audience. Sister Simone Campbell is a Catholic nun and a founder of the social justice-minded group Nuns on the Bus, Honduran feminist activist Berta Caceres, who fought for land rights for Indigenous farmers, Corazon Aquino, the first female president of the Philippines and an integral figure in the People Power Revolution which brought down a dictator, Indian eco-feminist Vandana Shiva who fights for gender equality in her field of biodiversity and environmentalism, and Lili’uokalani, the last monarch of the Kingdom of Hawaii. She is almost three quarters of the way through her set 100 days, and so far we are incredible impressed and astounded by such a badass (is there any other appropriate word??) women, some of whom we have never even heard of! Julie told Sean Eckhardt at Takepart.com that she wanted to do her part to fill in the gaps where women’s stories are missing, a problem we have talked about before on a number of occasions. “I’m really passionate about social justice and intersectional feminism…I talk to my students a lot about the importance of representation of marginalized communities and how powerful media is. Privileged people, including graphic artists, should use their platform to project responsible messages and make sure they’re not projecting stereotypes or oppression,” she explained. One of the common traits among these women is the knowledge that many of them have had to overcome hurdles and barriers to get where they are today. Whether it is comedian Leslie Jones being relentlessly trolled by racists on Twitter after ‘Ghostbusters’ premiered to education activist Malala Yousafzai literally being shot in the head by members of a terrorist organization, it is important to reiterate just how difficult and often hostile a place the world can be at times to women who dare to live outside the norms. Julie told The Huffington Post’s Erin Spencer why she told her particular title and the meaning it holds. “Babes are the people who encounter obstacles, give ‘em the middle finger, and do the thing regardless,” she said. It wasn’t a hard task coming up with 100 women for her project. At first she started a list by herself, then expanded it to a Google doc which she shared with her friends to invite suggestions. It took a mere 2 hours to get to 100 names, showing how important these stories are. 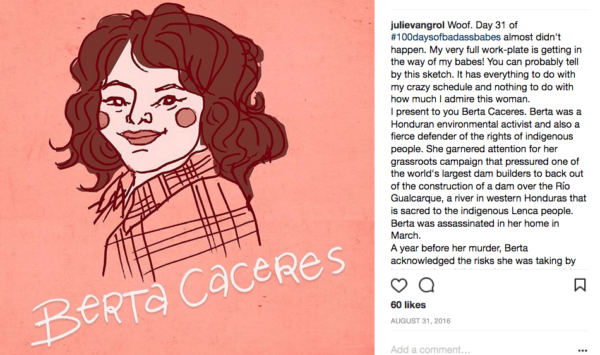 Ever since beginning her series she has had even more suggestions from fans and followers, so if you want Julie to know about a woman she has yet to include, we suggest you get in touch with her before the 100 days is up. If you have already done the math, you will know that day 100 will arrive after Americans go to the polls to vote for our next President (November 8). So there is a chance one of her future posts could be about how the US elected its first female president in over 200 years. 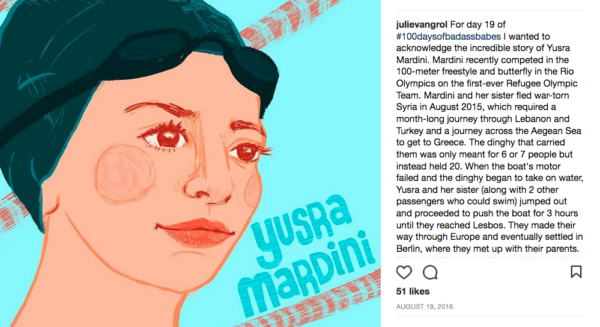 But there is still time to go before that date, so we encourage you to follow Julie on Instagram, comment and share her images and stories that accompany each woman. 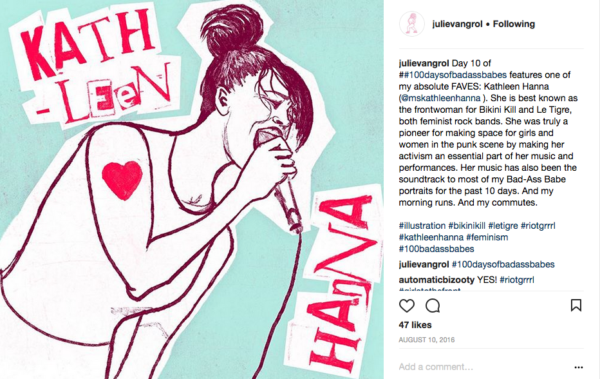 We are so inspired by #100DaysofBadassBabes so we have shared a few of our favorite images from her Instagram account throughout this post, and below.